Communications company Commsworld have agreed to sponsor the Fir Park club for the 2010/11 season. 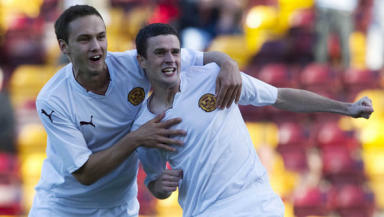 Motherwell have announced communications company Commsworld as their new shirt sponsor for the 2010/11 season. The one-year deal, worth a six-figure sum to the club, will see the company’s logo adorn the Steelmen’s home and away jerseys. A Scottish-based company with offices in Glasgow, Edinburgh and Aberdeem, Commsworld are described as being Scotland’s largest independent voice and data communications firm, with contracts with companies such as Kwik Fit, Parks and Glenmorangie. “We’re delighted that the club have secured such a lucrative deal with a well-known, established organisation,” Well boss Craig Brown said of the announcement. Brown recently revealed that Motherwell were unable to make additions to their squad as a result of budget constraints at Fir Park. Whether or not the cash injection will filter down to boosting the numbers remains to be seen. But, together with the club’s run to the play-off round of the Europa League where they will play Odense, the boss will no doubt be hopeful he sees some funds freed up for new blood. Motherwell kick off their 2010/11 SPL campaign with a home game against Hibernian on Sunday, August 15. The last encounter between the two sides ended in a 6-6 draw at Fir Park, with the live TV cameras making their way to Fir Park hoping for another goalfest.